The 2009 Fairfield County Concours d’Elegance Grand Prix d’Honneur for a foreign automobile was awarded to collector Oscar Davis’ superb 1938 Alfa Romeo 6C 2300 B Mille Miglia. There was more honours for the Italian marque as a 1937 Alfa Romeo 8C 2900 won the prestigious Founders' Automobile (with Special Recognition form Meguiar's) category. Alfa Romeo has taken centre stage at the Fairfield County Concours d’Elegance with the most important Grand Prix d’Honneur for a foreign automobile going to a stunning 1938 Alfa 6C 2300 B Mille Miglia and one-year-older 6C 2900 collecting the Founder's Automobile award. More than 7,000 visitors and spectators enjoyed a fabulous display of historic automobiles and motorcycles on the grounds of the Fairfield County Hunt Club in Westport, CT, this last weekend. The event this year attracted owners of over 230 vehicles for display at the show. Chairman and Founder Bill Scheffler: “This year – while generally not an easy year – has proven another success for our event and for the quality of cars and motorcycles people come to expect from us. The response on Club Celebration Day, the Nutmeg Tour for Autism and on Concours Sunday as well, has been overwhelming and a refreshing sign of optimism”. The Fairfield County Concours d’Elegance in Westport, Connecticut is one of the leading events of its kind in the United States. It presents 100 years of significant motor vehicles in a chronological display and highlights notable examples of automotive history in special exhibitions and classes. It attracts important entries from some of the country’s leading collectors and gives its guests an educational and truly engaging visitor experience. In 2009, the event has expanded to a full weekend of on-field activities with an extended classic car tour and extensive club meet on Saturday as well as the established Concours on Sunday. 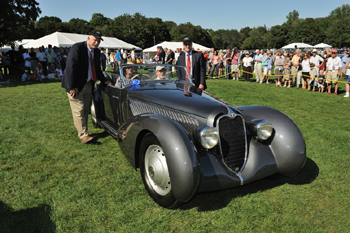 The 2009 Fairfield County Concours d’Elegance Grand Prix d’Honneur for a foreign automobile was awarded to collector Oscar Davis’ 1938 Alfa Romeo 6C 2300 B Mille Miglia. One of a group of cars called the “Sleeping Beauties”, it had been part a collection which was stored for decades by reclusive European car collector Michel Dovaz at his French chateau. Dovaz had purchased the car in 1956 and left it untouched at his chateau for 34 years, a part of his astonishing hoard of thoroughbred classics. This Alfa 6C 2300 B MM, finally sold from the collection in the 1990s, was eventually the subject of an extensive and detailed restoration. Well respected in the classic car world, this car has been awarded numerous trophies, most recently at the 2009 Amelia Island Concours d’Elegance where it took home Best in Class in the Prewar Sports Car category. There was more honours for the Italian marque as a 1937 Alfa Romeo 8C 2900 won the prestigious Founders' Automobile (with Special Recognition form Meguiar's) category. A new element of the 2009 Fairfield County Concours d’Elegance was Club Celebration Day for automobile and motorcycle clubs. Held for the first time, six clubs from the Northeast Region attended with more than 100 cars. Says Co-Founder and Director of Operations John Shuck: “We wanted to create another attraction for those people that help make our show into what it is, for the car enthusiasts and owners who so generally share their cars and motorcycles with us and the public. We are grateful for their efforts in bringing these cars to us, and with Club Celebration Day wanted to highlight them and their unrelenting passion in preserving these significant automobiles and motorcycles.” The attending clubs chose one car each per club which was awarded a place on the show field of the Fairfield County Concours d’Elegance on Sunday. These cars were: 1962 Aston Martin DB4 (Aston Martin Owners Club); 1964 Porsche 904 Carrera GTS (Porsche Club); 1964 Cadillac Eldorado, Henny and Alyda Karreman (Cadillac LaSalle Club); 1987 Mercedes-Benz 560SL, Jerry Williams (Mercedes-Benz Club); 1987 Maserati Biturbo Spyder, Anthony Ungaro (Maserati Club); and 2003 Ferrari Modena, Michael and Christopher Raduazzo (Ferrari Club). 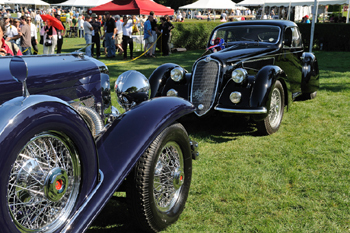 The Fairfield County Concours d'Elegance features programs tailored to benefit The Next Steps Developmental Center, a partnership of AIND/Giant Steps School, Southport, CT, and Hall-Brooke Behavioral Health Services. The center provides integrated, transdiscip0linary diagnostic and treatment services of children and adults with Autism Spectrum Disorders. Community Partners are the Westport Rotary Club, Stepping Stones Museum for Children.